$9 adults, $6 seniors & students with valid I.D. The new gallery was created by restoring the original garage structure adjacent to the historic Boddy House, located in the southeast corner of the 150-acre botanical garden’s property, and doubling it in size with additional gallery and support spaces. 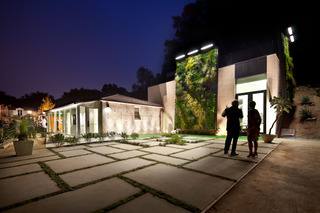 The gallery’s design, by the office of Frederick Fisher & Partners, Architects, Los Angeles, creates a composition of both the historic and the contemporary; incorporates the principles and practices of sustainable design; and provides Descanso Gardens with an important new resource in its expanding public outreach and education programming. The new gallery and the previous restoration of the Boddy House itself (done in 2007-08) continue the 50-year history of public/private partnership between the property’s owner, Los Angeles County, and the nonprofit, community-based Descanso Gardens Guild, which manages the Gardens. Funding for the gallery project came entirely from private sources, led by a $2.1 million gift from La Cañada Flintridge residents Heather Sturt Haaga and Paul G. Haaga Jr. Additional funding was provided by The Ralph M. Parsons Foundation, Georgianna and Paul Erskine of Pasadena, and a number of additional individual and foundation supporters. Incorporates the original, historic Boddy House garage structure with new construction that doubles the usable space and creates a unique composition incorporating both the old and the contemporary. Approximately 1,500 square feet of exhibition space and 300 linear feet of wall space, arranged in three complementary galleries — two fashioned from the original Boddy House garage structure and a third, featuring 12-foot ceilings and a unique skylight, in the new structure. Incorporates materials and technologies, and was built with processes in line with the principles and practices of sustainable design. Gallery Hours: Tuesdays through Sundays, 10 a.m. to 4 p.m. Gallery admission is free with Gardens admission. Copyright © 2006-2018 by ArtSlant, Inc. All images and content remain the © of their rightful owners.